I would like to thank the Reef Central community and especially Randy Holmes Farley for all of the articles, help and support over the years. I have learned so much from so many. I want to thank the TOTM committee and Nathaniel Walton for selecting my tank for May 2015 and for all of the hard work they do to pull the page together. I know how much work it takes. 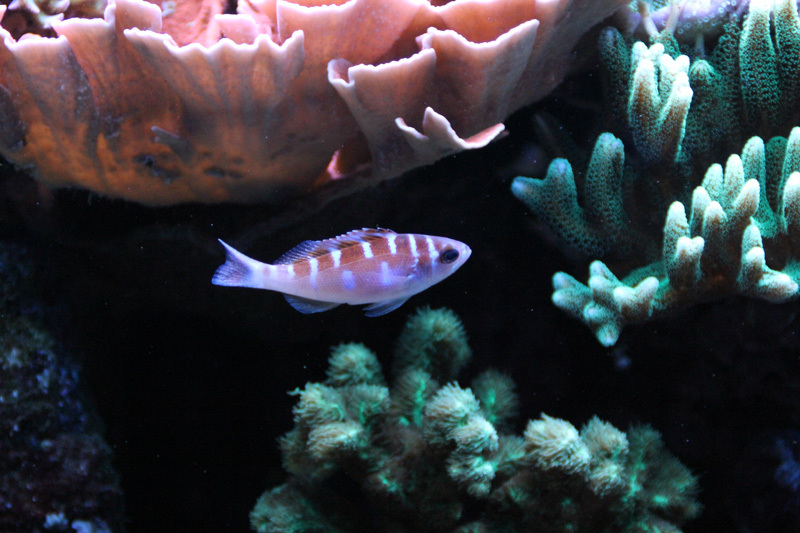 I live in Centreville, Virginia and also want to give a shout out to the Washington Area Marine Society (WAMAS). They too have been a wonderful group of friends and another great source of information. 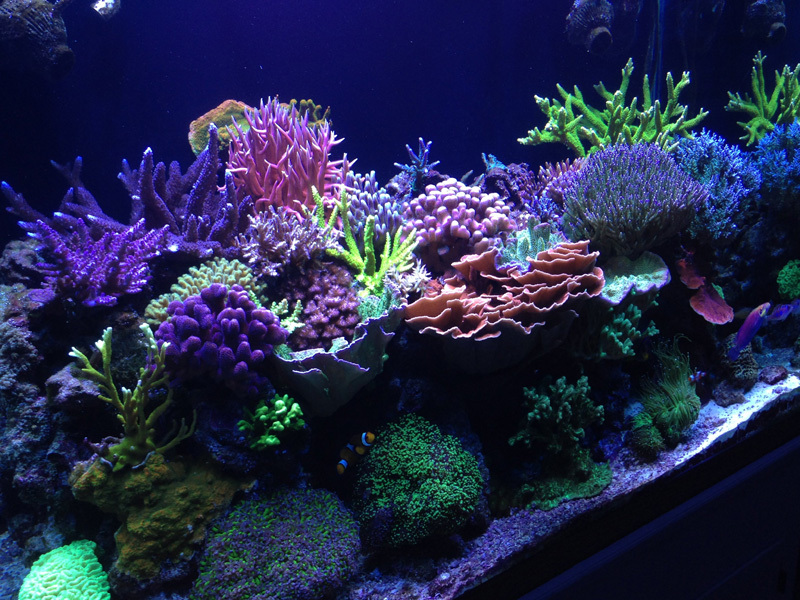 I have been in the reef hobby since June 2006 when my wife gave me a 30 gallon tank for an anniversary gift. 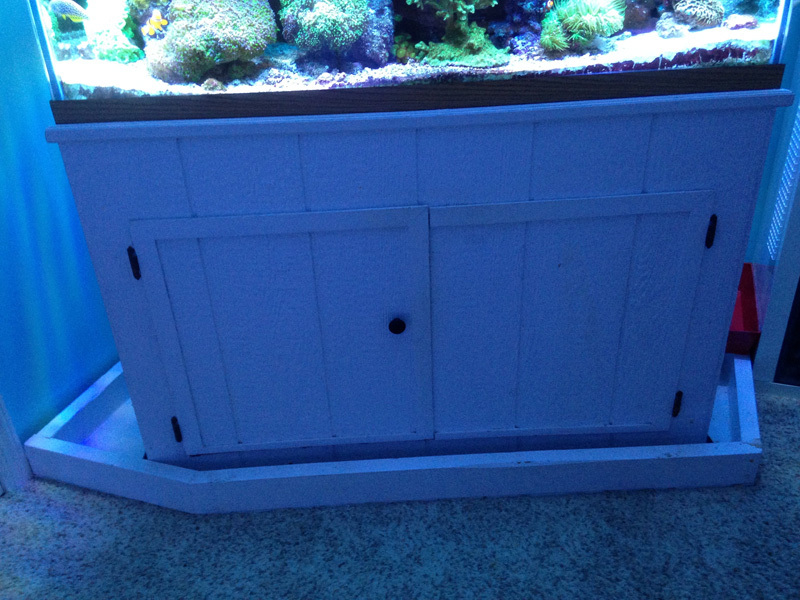 It went fairly well for about 2 years, so I bumped to a 90 gallon. That tank was up for about 3 years before it caught fire and I lost it all. I cleaned up the mess and rebuilt into a 120. Well, after 3 months, the bottom pane on that tank cracked and I lost it all again. After a second clean up, I started over for a third time with the 150. It was up for about 2 years and was being overrun by purple mushrooms. I tore it all apart in November 2013. I pressure washed every rock in the system and re-stacked. 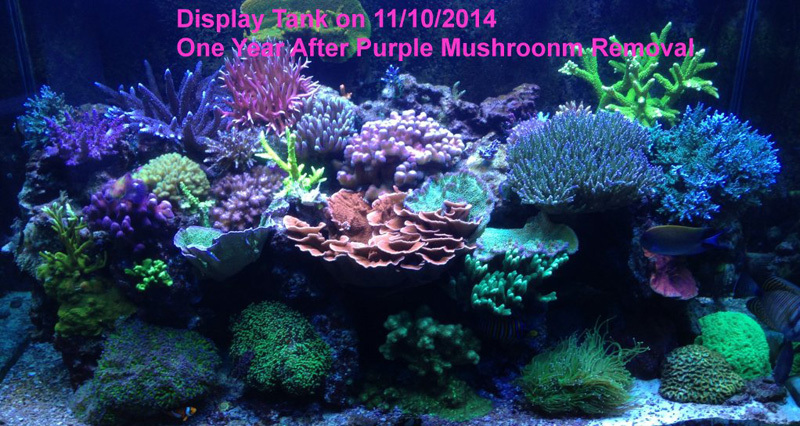 So the current tank has been up about 15 months at the time of this TOTM. You would think that after this many tank crashes my wife would have strung me up. Let’s just say she has been very, very patient. 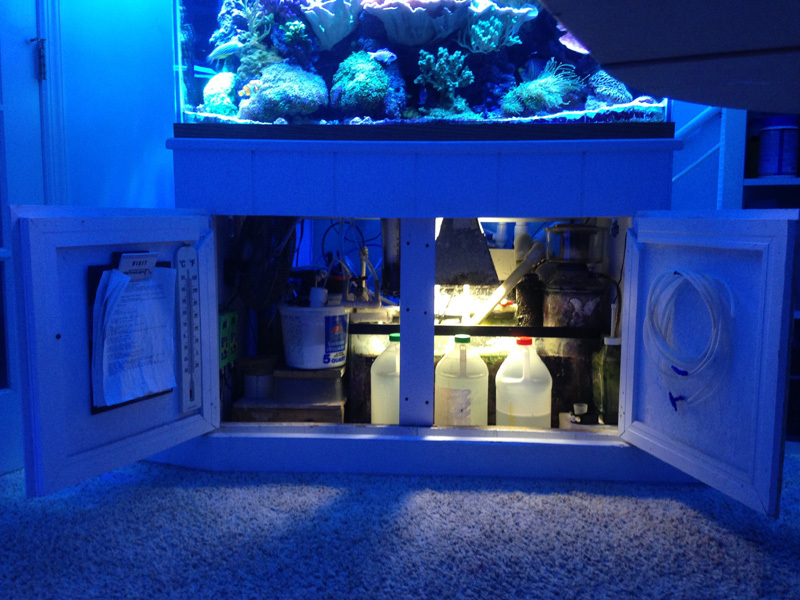 My mixed reef is in a 150 gallon tank (48”w x 30”h x 24”d) with a 20 gallon refugium. It sits in the home office and has seagull/beach music playing from behind it 24 hours a day. It makes for a very soothing work environment. My focus is primarily on SPS, but I have some LPS in the tank. Oh, I also have some fish in there. 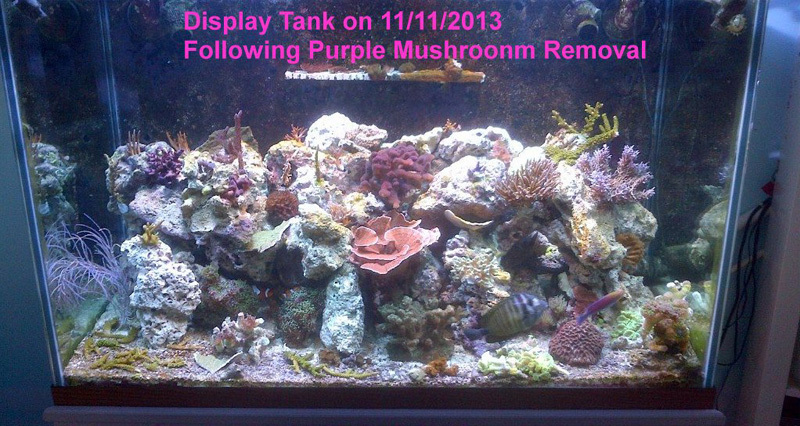 By far, I feel that the most important aspect to reef keeping is maintaining very stable water parameters. I have focused nearly all of my efforts and time on developing a low maintenance method for accomplishing this goal. I ran Randy Holmes Farley 2 part for many years. I ran a kalk stirrer by itself for a while, and finally after all of these years and faced with a very heavy alkalinity, calcium, and magnesium demand, I developed what I call the Kalk/Calc combo method. 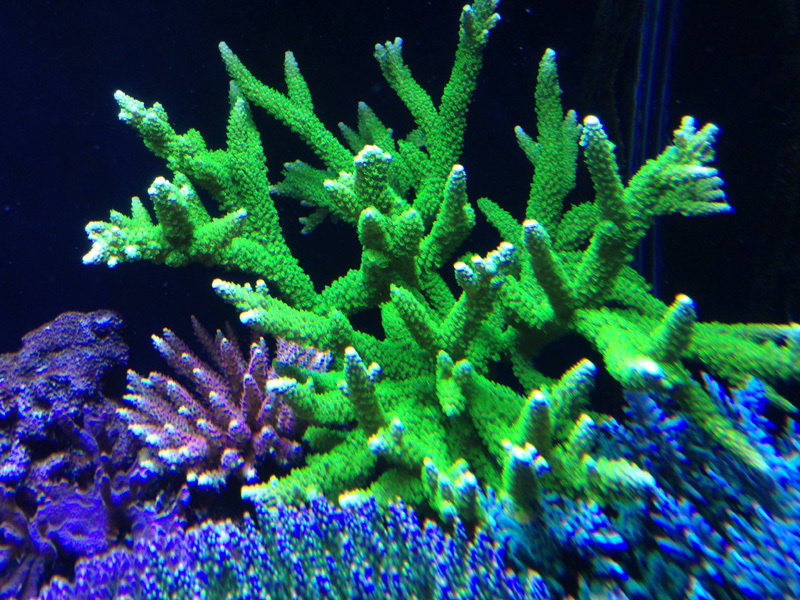 As you can see by the following pictures, it along with good lighting provide for good coral color and growth. I am very happy with this solution so I have written an article that provides detailed information about it. The article can be found at this web address. In brief, I knew I wanted to provide as much of the three elements as possible through kalkwasser addition (lots of reasons for this). In order to add kalkwasser (it can only be mixed with fresh water) you have to evaporate water out of the tank. I added 2 fans over the display (they also help keep the tank cool) and one fan over the refugium. I measured the evaporation rate and then use a dosing pump to add the maximum amount RO/DI water through an overflow style kalkwasser reactor that drips into the sump. With this overflow style kalkwasser setup, I never have to worry about a kalk overdose or having to add water to the system. 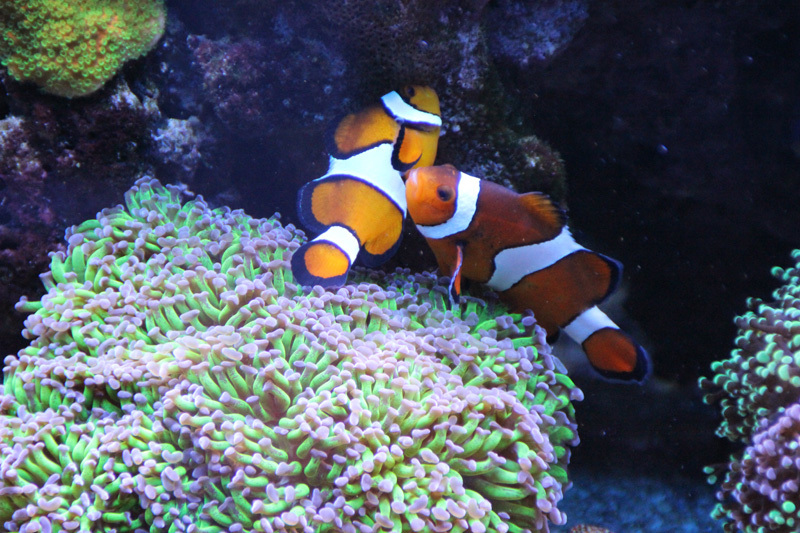 The alkalinity and calcium demand in my tank is much higher than I can meet with a kalk stirrer on its own. In order to meet the additional demand, I run calcium reactor with a dosing pump adjusted so that my parameters are exactly where I want them. To adjust the parameters up or down, I just go turn the knob on the calcium reactor dosing pump. This setup is very stable and easy to maintain. I rarely touch it and it has been running this way for years. I have to add a cup of kalk once a week to the kalk stirrer, I add media to the calcium reactor every 2 months or so, and I re-fill the CO2 tank every 4 months. The kalkwasser helps offset the low pH caused by the calcium reactor, but to really bring the pH up to levels I like, I have also added a couple of other components to the calcium reactor setup. Details of the setup can be found in the article I mentioned earlier. One thing I will say is, buy good dosing pumps that have adjustable flow rates. Other than these two reactors, the only thing I dose is some Randy Holmes Farley recipe magnesium as needed. 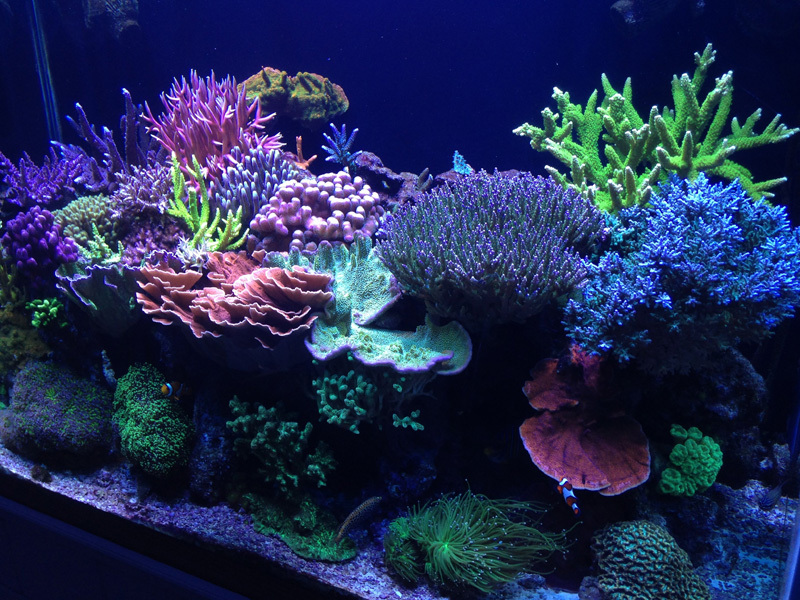 Along with water parameters, lighting has been the other focus in my 8 years of reef keeping. I have studied what must be hundreds of TOTM and visited as many tanks in person. 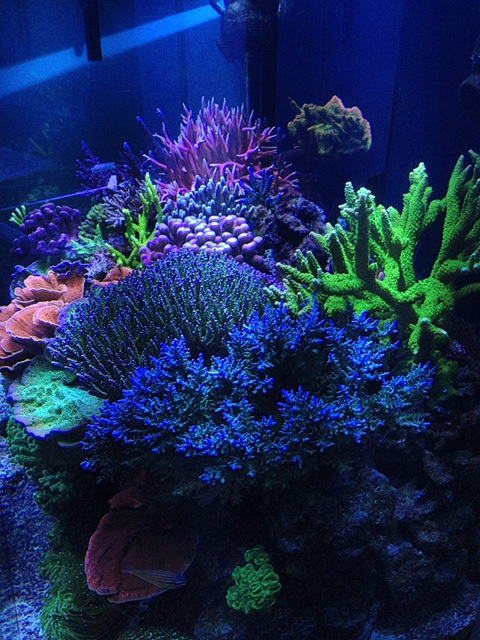 Whenever I see a tank that has great color or growth, I take note of the lighting. 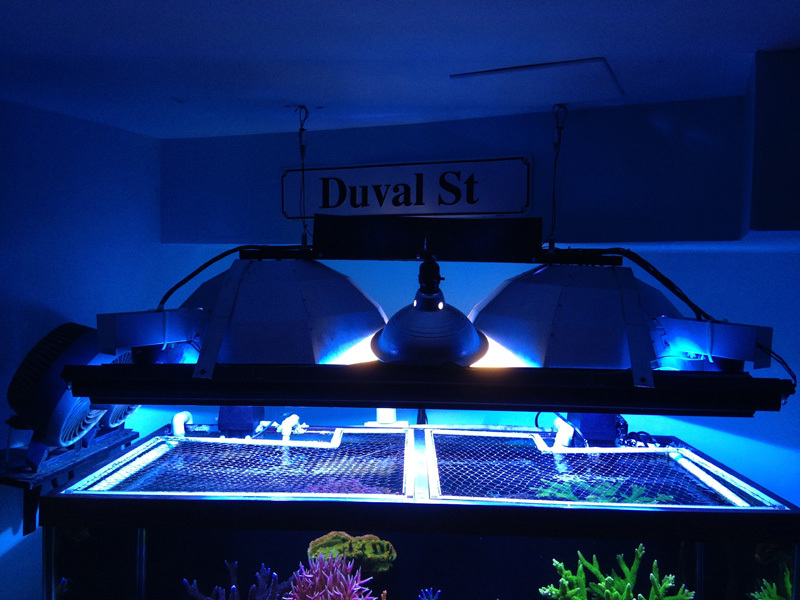 From all of this experience, I have come to the conclusion that the perfect light scheme for color and growth includes Radium bulbs driven with Reeflex Cube magnetic ballasts and supplemented with UVL VHO Super Actinic bulbs. It may cost a little money to run this setup, but it pays for itself easily with frags. I do not have this exact setup as I cannot squeeze the large diameter VHO bulbs in the space I have. 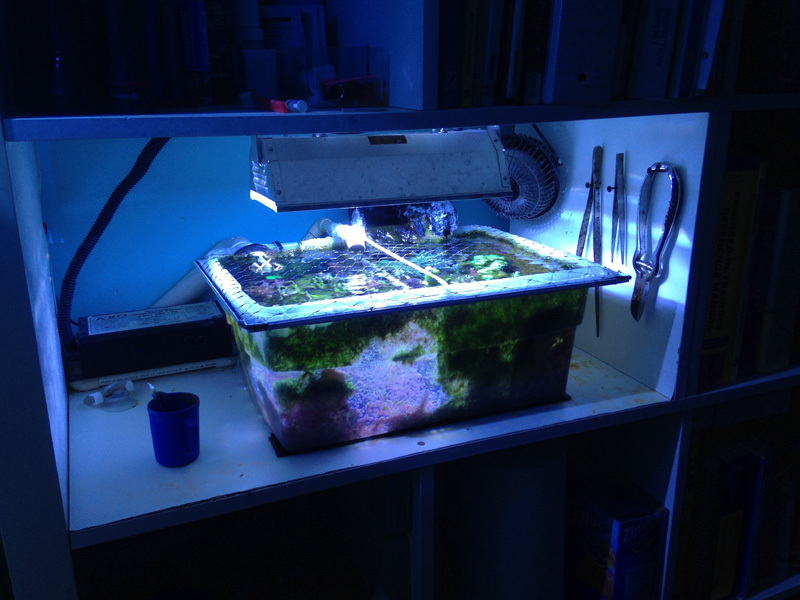 Instead for supplementation I run ATI Aqua Blue Plus T5 bulbs and they seem to do a good job as well. So in summary, I run two 250watt SE MH Radium 20,000K bulbs in Lumen Bright 3 Metal Halide Reflectors (Large 19.5" x 19.5" x 9") driven by two 250 watt Reeflex Cube magnetic ballasts for the main lighting. 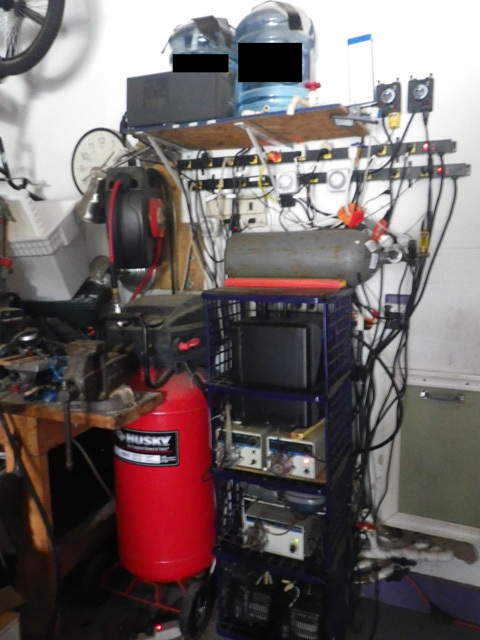 I supplement with two 54watt ATI AB+ T5 bulbs running on Icecap 660 ballasts. I also have a 5,500K compact florescent located in the center of the fixture that adds a little yellow to the mix. The water is filtered by three primary means. I have an ASM G-3 Counter Current skimmer equipped with a Sedra 5000 pump, a 20 gallon refugium filled with Chaetomorpha macro algae, and I do 10% water changes every week. I farm out a softball size wad of Chaeto every Saturday morning to keep the stuff growing fast. I believe the real winner here is the macro. Of course there is also about 100 pounds of live rock and I run carbon and a small amount of ferric oxide 24/7 in a couple of small reactors. I would not say I have super crazy flow in the tank. There is enough to keep the LPS swaying back and forth. I have a Blue Line 55HD external pump (1,100 GPH) that returns water from the sump to one outlet in the display. I have a Mag 9.5 (950 GPH) that drives a closed loop with two inlets at the lower rear of the tank and two outlets at the front top of the tank. Finally, there are a couple of Tunze 6065 power heads mounted to 1/2" Sea Swirls (DIY) at the rear of the tank that swing back and forth across the corals. 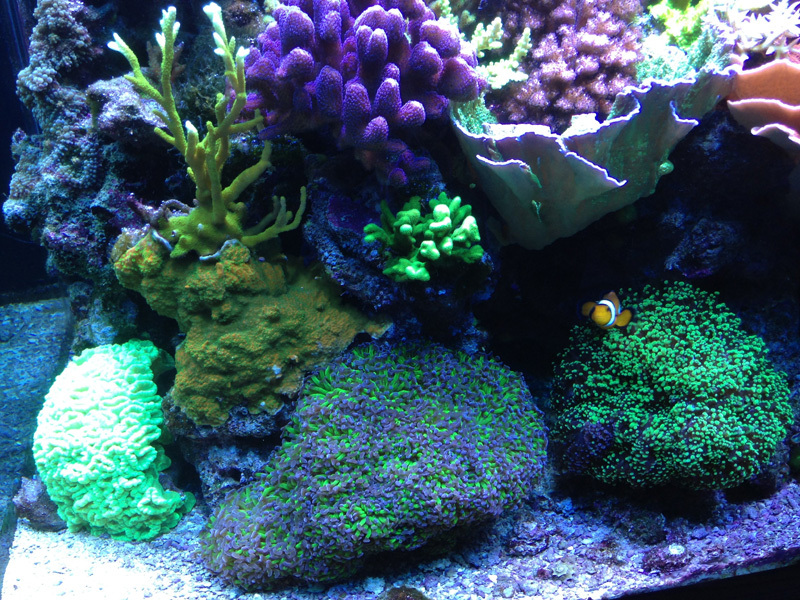 I keep a mixed reef so there are corals and fish from all over the place. 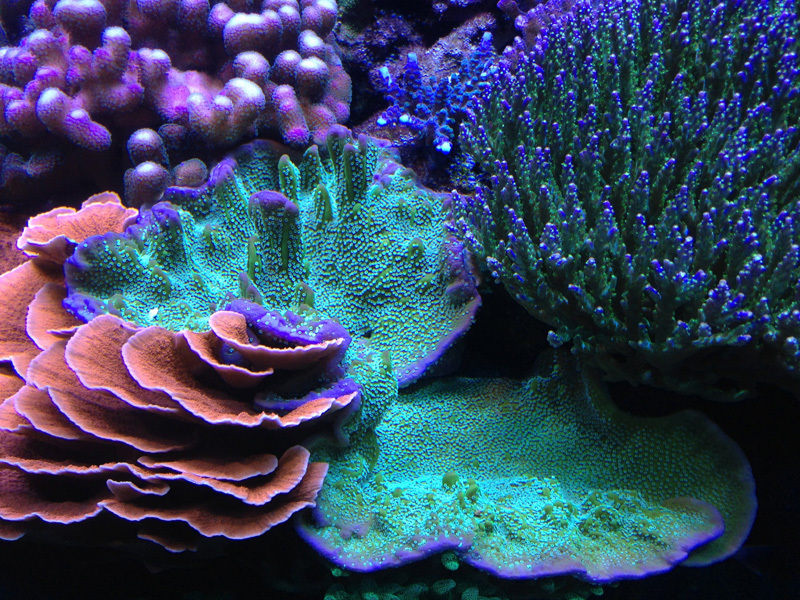 As far as corals go, SPS are my favorite for some reason. Maybe it is the challenge, maybe the colors? 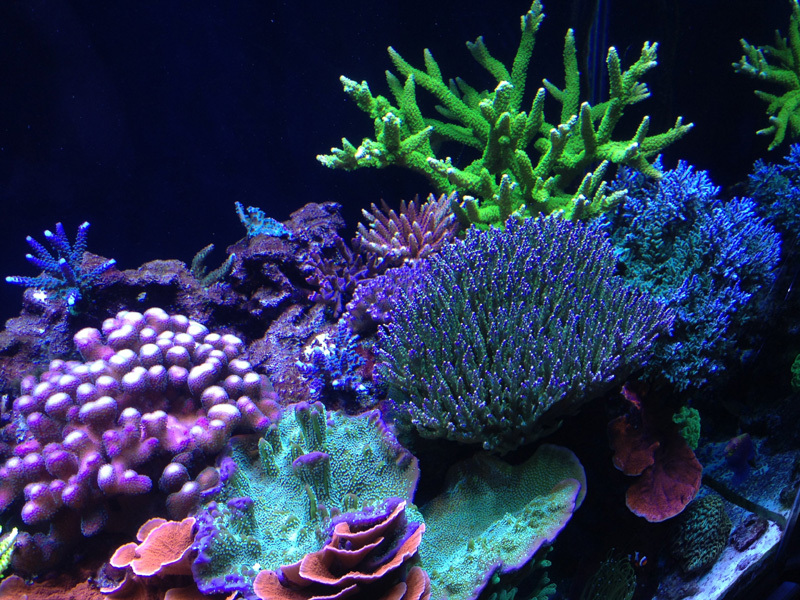 I start all of my corals from small frags and grow them out. 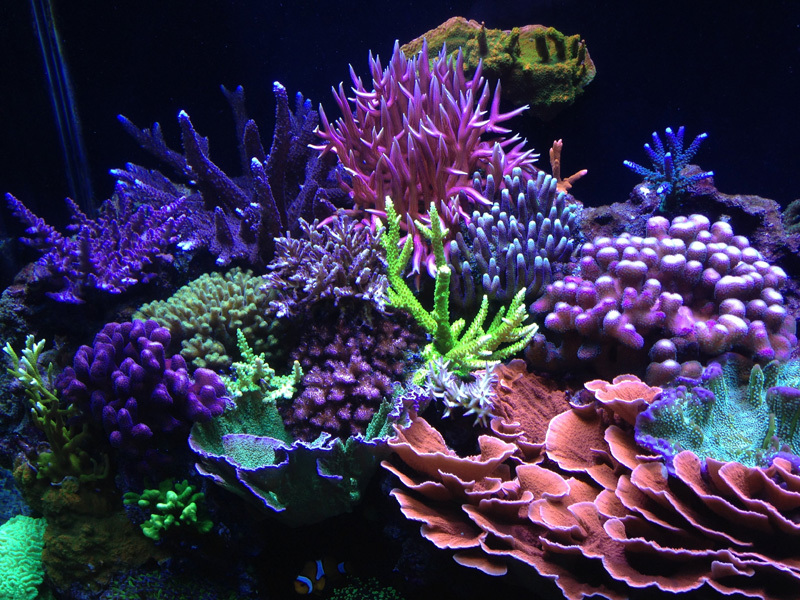 My favorite SPS (if you could not tell from my avatar) is the Purple Monster coral. 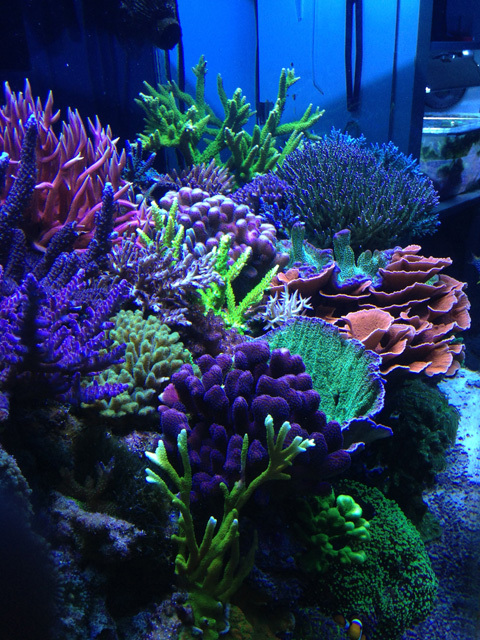 I have a few LPS corals and I would say my favorite is the frogspawn. Again, color is what draws me to this coral. 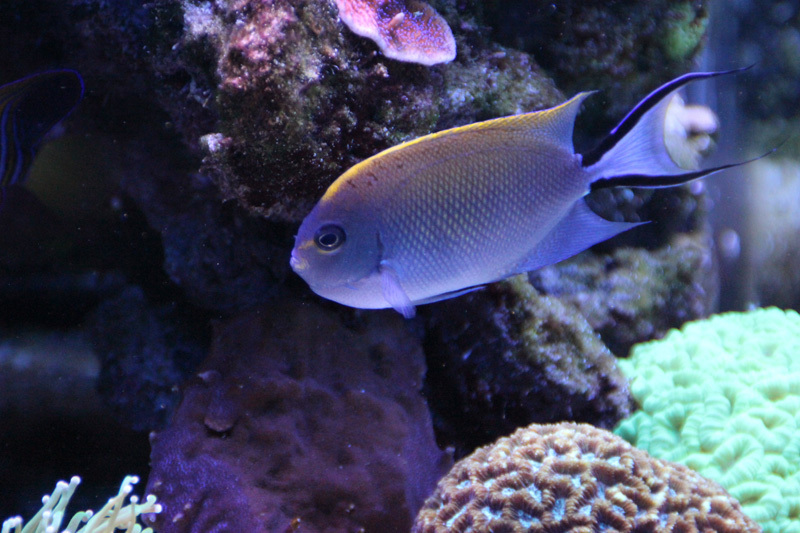 As far as fish go, I would have to say my favorite is my Desjardini tang. 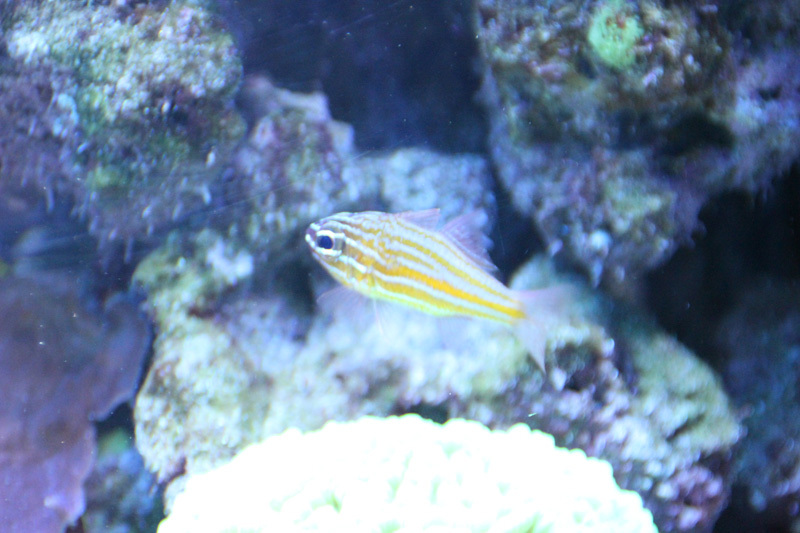 This guy is the only fish to survive all of my tank crashes and has been with me since 2006. He is a trooper and has many scars from all of the stress. 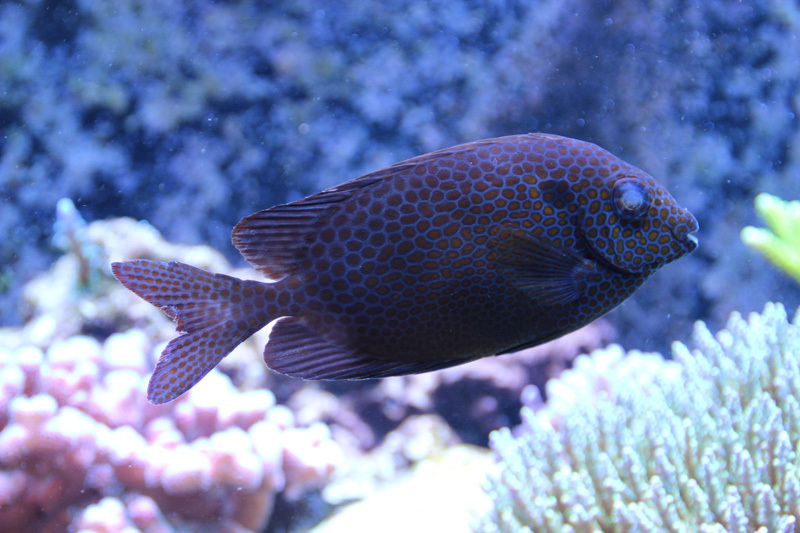 He is also a super peaceful fish that just seems to keep all the fish mellow. 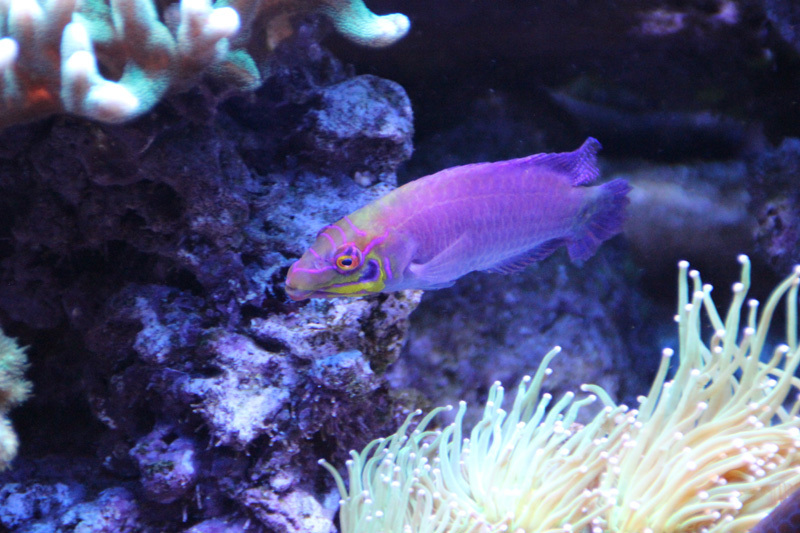 I also have a large Mystery Wrasse who has been with me for years that loves to get in my face at the glass and dance. 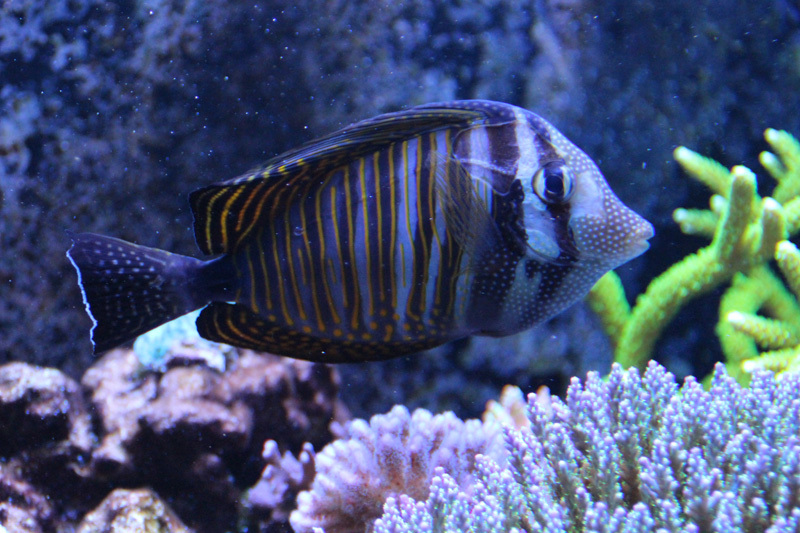 I feed 2 large pinches of Ocean Nutrition Formula Two or Prime Reef flakes once a day. I also add 3 frozen cubes of Piscine Energetics Frozen Freshwater Mysis Shrimp. Twice a week I put in a good size sheet of algae in a clip. Coral color has always been my biggest challenge. To this day, I am trying to get better color out of my SPS. As mentioned earlier, I have tried everything from various lighting schemes to water parameters to feeding and I still have not gotten the colors I am looking for. Reef keeping has been a heck of a challenge. But it provides me with hours of enjoyment. 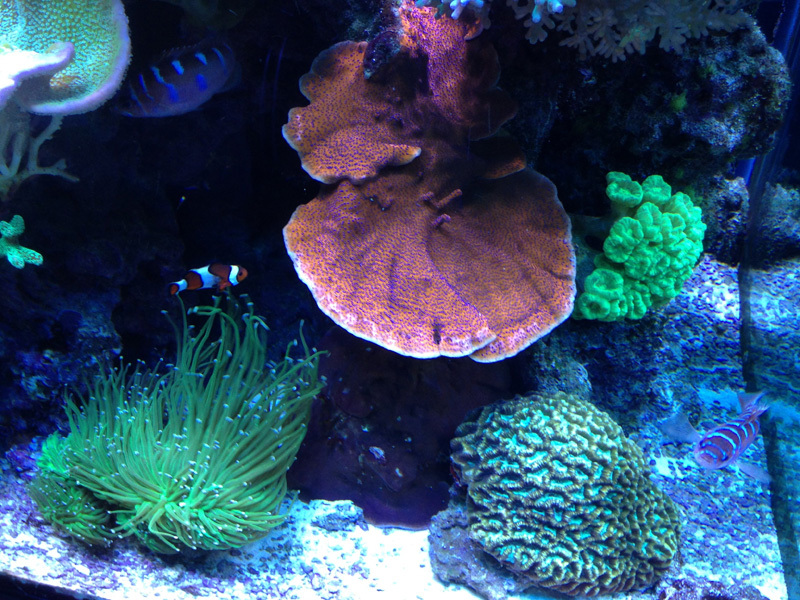 Whether I am standing at the tank staring at the coral or building some new DIY project to reduce maintenance, I just love being around the tank. It can cause heavy stress, but most often is a stress reducer. 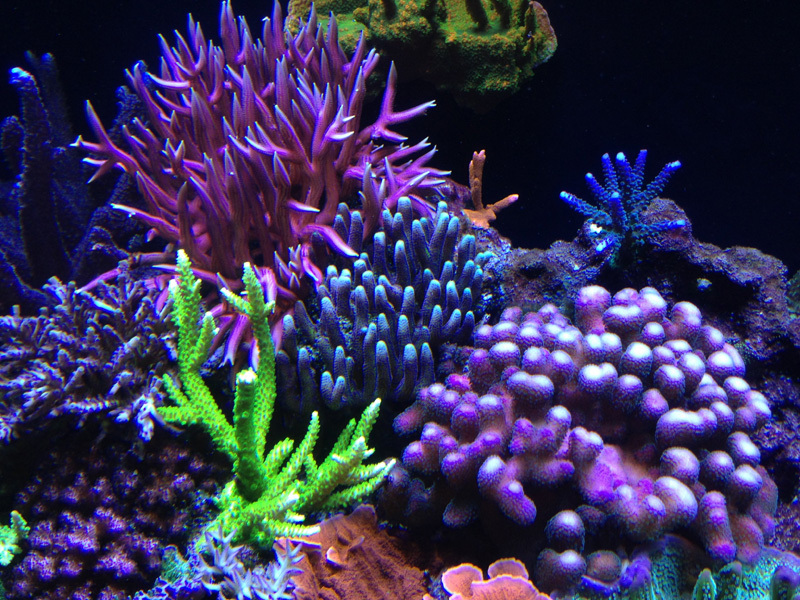 I believe the best way to keep improving your reef is to visit every TOTM on the web and read what other successful aquarists do. I am always amazed at what people come up with to make their tanks pop.